"In other words, applying this to our day, keep the children in sun suits, or next to nothing, as long as possible, that becoming accustomed to this, they will see nothing wrong with exposing the body later on. Make the blouses sheerer year after year; the sweaters and jeans tighter; the shorts, shorter; the daytime dresses, sleeveless; the formals, strapless or with thin straps at best; the bathing suits more daring; all with the idea that the fashions should reveal as much as possible, rather than conceal. Who but the Devil could devise such a clever scheme, knowing the inevitable result that would follow because of fallen human nature caused by original sin? "This plan was published many years ago, but we see from the current fashions how modern women have fallen for it, including many Catholics. Since it was done so gradually, without their being aware of any organized program, is it any wonder our young girls ask, 'What's wrong with the modem fashions?' Having been reared in them, many from the time they were children, they see nothing wrong with them, nor the dangers to themselves or to others. "Our young people are great imitators. They like to 'follow the crowd.' This is fine so long as the crowd is going in the right direction. Otherwise, it can lead to serious trouble, especially in the matter of fashions. Too many teenagers say: 'Everybody else does it, so why can't we?' If everybody else jumped in front of a fast moving train, would you do the same? Because' everybody else does it' is no reason for us to do wrong. There is no security in numbers. What was wrong centuries ago as far as sin is concerned, is still wrong today. God made no special provisions for the 20th century. If 99 people do wrong because 'everybody else does it,' God will punish the 99 and reward the 1 that follows Him. This was proven at the time of the deluge, when he destroyed all, save Noah and his family. Our Holy Father Pope Pius XII has stated repeatedly: 'The greatest sin of our modern generation is that it has lost all sense of sin.' This is true particularly in regard to fashions, and the virtue of purity." It was on the Feast of the Immaculate Conception, December 8, 1944, that Father Kunkel initiated the Purity Crusade of Mary Immaculate with the Episcopal Blessing of his Bishop, the late Most Reverend Henry Althoff. Pope Pius XII imparted his Apostolic Blessing to this Purity Crusade on July 14, 1954, and again on May 11, 1955 "to the members, to their Directors and Moderators, to their families and loved ones, and to all who further their laudable movement for modesty in dress and behavior." Another voice to speak out strongly against the immodest fashions was that of the late Archbishop Albert G. Meyer of Milwaukee, Wisconsin who, on May 1, 1956, wrote a Pastoral Letter to the Clergy, Religious, and Faithful Laity of his Archdiocese on the subject of Modesty and Decency. We are going to quote at length from his Pastoral Letter, as he not only discusses the problem, but also speaks of the effects, and recommends remedies. 'Heedless that his nature has God for its origin and destiny, and reason and revelation for its divinely commissioned guide, man will do what no other creature can---he will deny his true nature and will destroy all that is good within himself. Such a process of degradation is viciously at work in our own country, where the deification of the flesh continues to enlist new devotees. Through the liturgy of advertisement, entertainment and literature, this cult bids fair to corrode our national sense of decency... The Catholic Church has never failed to accord the human body an immense measure of honor. She affirms that it was originally created by God; in one instance actually assumed by Him; in every instance meant to be on earth His special temple, and destined eventually to rejoin the soul in His Beatific Presence. "The first teaching of our Faith is that the law of purity is imposed on every human being. It binds him in public and in private, in marriage and outside of marriage, in youth and in old age .It is one of the serious laws that God has made, which means that it is one on which the salvation of our soul depends. It is quite obvious that this law of purity forbids the evil deed (Do you not know that neither fornicators, nor adulterers will possess the kingdom of God?' 1 Cor. 6:9-10), and the evil word (But immorality and every uncleanness, let it not even be named among you.' (Eph. 5:3). The same law of purity equally forbids the unchaste thought and the unchaste desire (I say to you that anyone who even looks with lust at a woman has already committed adultery with her in his heart.' (Matthew 5:28). Impurity, therefore, in thought and desire, as well as in word and in deed, is a serious violation of a law established by God Himself And it is seriously wrong precisely and primarily because it transgresses the law of God. Moreover, the external act is merely the fruit of the internal thought and desire. It is this internal thought and desire which is the source of the external act Out of the heart come evil thoughts, adulteries, immorality, blasphemies.' (Matt. 15:19). "The second teaching of our Faith which we ask you to recall here is the doctrine of Original Sin. Every human being, except the Immaculate Mother of God, has through original sin inherited a tainted nature, which manifests itself more intensively perhaps in inclinations to impurity than in any other way. The resulting battle with concupiscence is not limited to a given age or state of life; it must be waged by all and at all times. It is the teaching of our Faith that through Original Sin man's nature has been wounded. The wound in our nature is experienced through the struggle which we have to control our imagination and our passions. Imagination by it self, we know, is simply a picture making power. It certainly is of real use to the intellect of man, but because of Original Sin it can also playa part in the mind's affairs totally out of proportion to its merits. Hence, to feed the imagination with all sorts of pictures which serve to excite the passions in man's bodily nature is obviously against God's plans and God's will. Such pictures tend to make the passions rebel against the control of the intellect and will, and to draw the will itself away from conformity to God's will. That is sin! Original Sin and its consequences in our fallen nature impose upon us the obligation of keeping the imagination under proper control of the intellect and the will. "The third teaching of our Holy Faith is that this weakness of human nature, which is the result of original sin, can be met only by means of prudence and right reason, and by using the plentiful means of supernatural graces that have been provided for us by our Divine Savior. The world uses neither. Prudence tells us that we must reasonably avoid whatever tends to make the imagination rebel against the intellect and will, and to draw both of these away from God. The prudence, therefore, which sees that the virtue of purity is a necessary good, also sees that certain things must be avoided to assist the will in the pursuit of that good. The world does not use prudence in the matter of purity... It provides a constant flow of incentives to lust, completely heedless of the intimate and necessary connection between modesty and purity, and indeed often denying the sin of impurity itself. Emphasizing the dictates of prudence. Christ requires: 'If thy hand or thy foot is an occasion of sin to thee, cut if off and cast it from thee! It is better for thee to enter life maimed or lame, than, having two hands or two feet, to be cast into the everlasting fire. And if thy eye is an occasion of sin to thee, pluck it out and cast it from thee! It is better to enter into life with one eye, than, having two eyes, to be cast into the hell of fire.' (Matt. 18:8-9) The world does not heed this admonition of Christ because it denies the reality of the sin of scandal, and because it ignores or despises the supernatural means (the Sacraments and prayer) for preserving purity. "These three facts of our holy Faith point to a threefold obligation on our part. First, to love purity for itself, as binding on all of us, in all the public and private relationships of our lives, as necessary for the salvation of our immortal souls. Second, to use prudence and common sense to protect it. Third, to use the supernatural means of prayer and the sacraments to preserve it. Listen to these words of our Holy Father in an encyclical letter of March 25, 1954 in this regard: 'It is abundantly clear that with this warning (quoted above from Matt. 18:8-9), our Divine Savior demands of us above all that we never consent to any sin, even internally, and that we steadfastly remove far from us anything that can even slightly tarnish the beautiful virtue of purity. In this matter no diligence, no severity can be considered exaggerated. Flight and alert vigilance, by which we carefully avoid the occasions of sin, have always been considered as the most effective method of combat in this matter. Moreover, to preserve purity unstained, those helps must also be used which entirely surpass the powers of nature, namely prayer to God, the Sacraments of Penance and Holy Eucharist, and a fervent devotion to the most Holy Mother of God." "In general, that form of dress may be said to be immodest which serves to arouse the lust of men, or which serves as a scandal, that is, a stumbling block, to the practice of virtue... We must emphasize in the strongest possible language that it is Catholic teaching, based on the most clear words of Christ Himself: that impure thoughts and desires freely indulged are serious sins. To invite such impure thoughts and desires through dress, action, or the printed and pictured story (literature, movies, television) cannot help but participate of the grave sin of scandal and cooperation." As far back as 1928, Pope Pius XI sensed where this trend to uncover more and more of the body would lead if not corrected, and, on August 23, 1928, ordered a "Crusade Against Immodest Fashions, Especially in Schools Directed by Religious". The letter containing the order was sent to all Ordinaries of Italy through the Sacred Congregation of Religious. Then, on January 12, 1930, Pope Pius XI directed the Sacred Congregation of the Council to issue a strongly-worded letter on Christian modesty to the whole world. Yet to this day, very few Catholics have even heard of this document, and scarcely anyone seems to know its gravely-worded contents. (Liberalism could see no need for the Pope's Modesty Crusade. It kept insisting that "custom" determines what is modest and what is immodest in attire---even when these shameless customs were introduced for profits by heathen commercialism.) This 1930 letter imposed the obligation of combating the immodest fashions and promoting modesty, on all persons in authority---Bishops, and other ordinaries, parish priests, parents, Superioresses, and teachers in schools. First we will quote excerpts of this 1930 letter, and then quote the Standards previously issued by the Cardinal-Vicar of Pope Pius XI on September 24, 1928. 1. "The parish priest should command that feminine garb be based on modesty, and womanly ornament be a defense of virtue. Let them likewise admonish parents to cause their daughters to cease wearing indecorous dress. 2. "Parents, conscious of their grave obligations toward the education, especially religious and moral, of their offspring, should assiduously inculcate in their souls, by word and example, love for the virtues of modesty and purity; and since their family should follow the example of the Holy Family, they must rule in such a manner that all its members, reared within the walls of the home, should find reason and incentive to love and preserve modesty. 3. "Let parents never permit their daughters to don immodest garb. 5. "Superioresses and teachers must not receive in their colleges and schools immodestly dressed girls, and should not even make an exception in the case of mothers of pupils. 6. "Nuns, in compliance with the Letter dated August 23, 1928, by the Sacred Congregation of Religious, must not receive in their colleges, schools, oratories or recreation grounds, or, if once admitted, tolerate girls who are not dressed with Christian modesty; said Nuns, in addition, should do their utmost so that love for holy chastity and Christian modesty may become deeply rooted in the hearts of their pupils. 9. "Maidens and women dressed immodestly are to be debarred from Holy Communion ... further, if the offense be extreme, they may even be forbidden to enter the Church." In order that uniformity of understanding prevail... we recall that a dress cannot be called decent which is cut deeper than two fingers' breadth under the pit of the throat, which does not cover the arms at least to the elbows (see exception below), and scarcely reaches a bit beyond the knees. Furthermore, dresses of transparent materials are improper. IS THE ORIGIN OF THE 9/24/28 DIRECTIVES BY POPE PIUS XI WELL-ESTABLISHED? Yes, it is. Bishop Douville of Quebec, Canada, in his pastoral dated July 22, 1944, quotes the exact directives given, and adds that they were issued by the Vicar-Cardinal of Rome on September 24, 1928. The Philippine Hierarchy officially recognized the 1930 Special Instructions of the Sacred Council as prescribing the Roman Standards of Modesty in dress for women and girls all over the world. Acting upon this letter from the Sacred Council, the Philippine Bishops issued a joint pastoral on May 19, 1931, prescribing these Roman Standards for all their Dioceses. And on December 6, 1959, His Eminence Rufino Cardinal Santos, Archbishop of Manila, issued a lengthy and masterful Pastoral Letter to "confirm once more and declare in full vigor in our Archdiocese what the Holy Father and the Catholic Hierarchy have stated on different occasions." The Cardinal then repeats the "Church's stand concerning modesty in dress" by quoting the standards set by Pope Pius XI. Further, a "League of Modesty" was formed in Chicago, Illinois, as directed in the Instructions of January 12, 1930, to promote these standards given by the Cardinal-Vicar of Rome. In 1935 this League issued a folder with the Imprimatur of His Eminence, George Cardinal Mundelein, in which these standards were incorporated. The folder reads, in part: "Since unity of action through the adoption of a unified standard is necessary, if such a movement is not to shatter on the rocks of discordant opinions, the following standard of modesty in dress has been evolved based on the norm laid down by the Cardinal Vicar of the Holy Father." 1. 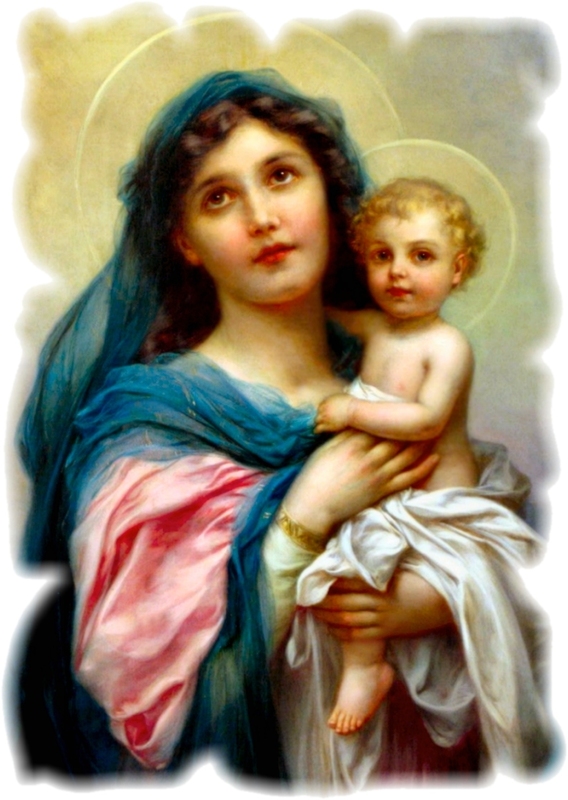 Marylike is modest without compromise, "like Mary," Christ's Mother. 3. Marylike dresses require full coverage for the bodice, chest, shoulders, and back; except for a cut-out about the neck not exceeding two inches below the neckline in front and back, and a corresponding two inches on the shoulders. 4. Marylike dresses do not admit as modest coverage transparent fabrics, laces, nets, organdy, nylons, etc.---unless sufficient backing is added. However, their moderate use as trimmings is acceptable. The Marylike standards are a guide to instill a "sense of modesty." 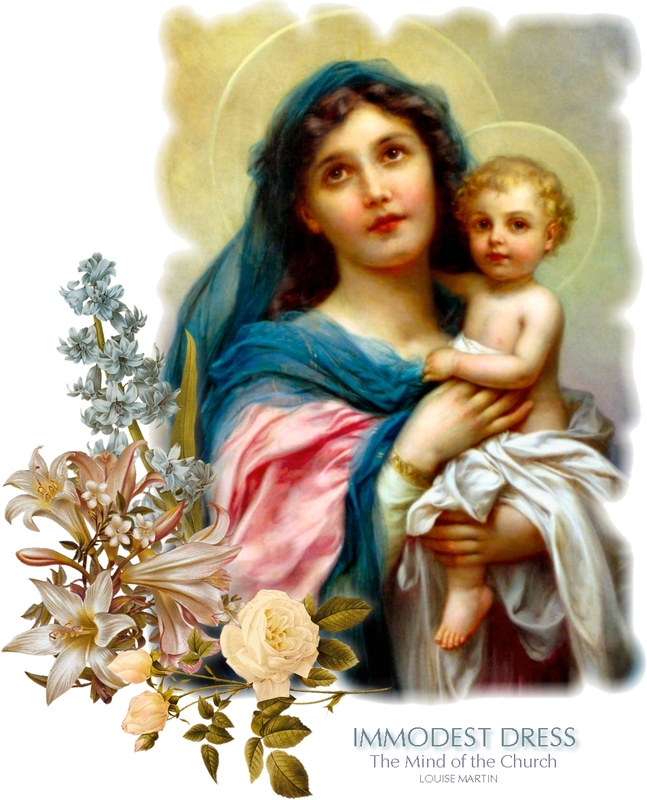 A girl who follows these, and looks up to Mary as her ideal and model, will have no problem with modesty in dress. She will not be an occasion of sin or source of embarrassment or shame to others. There always exists an absolute norm to be preserved, no matter how broad and changeable the relative morals of styles may be ... Style may never give a proximate occasion of sin, and clothing must be a shield against disordered sensuality. Another sophism which the Holy Father's address explodes. "He must have a dirty mind if the current styles are such a great temptation to him." On this point the Supreme Pontiff assures us. "Greater sensitivity to the warning against the snares of evil, far from being cause for criticism of those who possess it as though it were only a sign of interior depravity, is on the contrary the mark of an upright soul and of watchfulness over the passions." Sensitivity, then, a careful guarding of the "eyes that they may not behold vanity" (Psalms 118:37), is rather the mark of a clean mind. A "dirty mind" sees no temptation in immodest dresses. The dirt is already in that mind which can see no need for closing the shutters of the eyes. Just as an untidy housewife is "not affected" by dirty shoes entering her dirty house.